Taking a leaf out of my colleagues blogging practice – I’m just going to drop all the pictures I’ve been working on for the Shelonians. There are a fair few pictures – so hold on to your hats. Starting with some head concepts and ideas – just trying to work out how their heads will look. Reptilian without being dinosaurs, Tortoise without being to bird like. Trying to develop 2 designs to work in unison has been a particularly interesting challenge. Essentially these are the same character, but at different stages of his life. One as a youthful, energetic teen – full of vim and vigor. The other a seasoned vet, past his prime, with his glory days fast receding. First up – I was trying to get a better pose for the Pup, and then work on some more variations. I’ve been struggling a lot with how their armored shells will look. Most of my early designs were very “Tortoise-esqe” which was an underlying design theme. But i’ve been trying to push it into a new direction. You can see in the GIF where i’ve brought in some reference images. They are (From left to right) Stegosaurus Bones, Strange bladed creature concept from the internet, and Hermit Crab shell. My favorite was the stegosaurus plate armour. BUT I felt they were a little too flat and spiny – so I was trying to work out how to beef them up. There was one of my earlier elder concepts that was also fairly stegosaurus-y. So I grabbed both of them and started to work on them together. Lastly, cause I needed to paint something else. 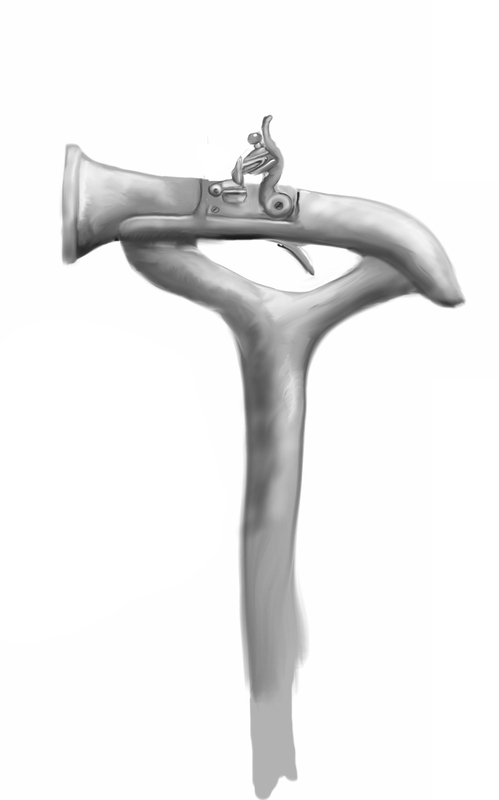 I did a quick mock up of what the elders antique pistols could be – They could potentially be worked into his walking canes… just an idea.